As I sit by the pool in sunny Nashville, my mind wanders back to Philadelphia. Today my sister-in-law and brother are packing up their house in downtown Philadelphia and moving to Phoenix. I’ve been texting with her all morning, convincing her it’s the right thing to do, it’s a new adventure, and she should be excited. In a last ditch effort to distract her from the move, I tell her something that happened to me when I was in Philadelphia last week. We were driving home from dinner one night after the show when we stopped at a red light. The sign on the sidewalk blinked the white person signifying that was safe to cross and out of the corner of my eye I saw something moving in the crosswalk. Rob was talking, but I wasn’t listening; I was concentrating on this thing crossing the street. I watched a man on the corner throw a crumpled paper at it, and it just scurried along, trying it’s best to make it across the street before the light turned green. I rolled down my window and stuck my head out to get a better look. It was a cockroach the size of a small child crossing in the crosswalk, just like he knew what he was doing like he belonged there and was just following the rules. 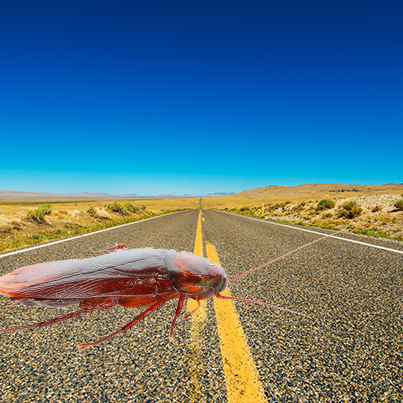 It was the biggest cockroach I had ever seen in my entire life, and I instantly felt as if our car covered in them. I even swore I heard crunching under our tires when the light turned green, and we drove across the crosswalk. Like every city we work in, Rob and I ask the question, “Could we live here?” We were having that very conversation when I saw the childlike cockroach crossing the street. My answer was immediate NO! It was no for a number of reasons, but the number one reason was I didn’t want to live in a city where cockroaches knew and obeyed the laws of Sesame Street and crossed at the light. As we were driving home to Nashville, we stopped for the day in New York. I had never been a fan of New York City. It intimated me, I never felt like I belonged, and always felt severely out of place, but this time was different; I loved it. After Rob’s meeting, we were in a car going to get some dinner, and I said to him, “I think I could move here.” He was delighted because he had been saying the same thing for months. By the time we were eating dinner, we were looking up apartments in the city, and I was concocting a story to tell the kids. That’s when my sister-in-law told me a story about her friend who moved to New York City. She was on her bed, and a rat, the size of a cat, fell out of the ceiling and landed on her. There went my desire to want to live in New York City. The next day we got home to Nashville. It was amazing to be sitting on my couch. Drinking coffee out of my favorite mug and having just woken up from sleeping in my bed. Nashville seemed small, almost country like, but it also felt like home. It felt cockroach and rat-free, and while I’m certain both types of vermin live in Nashville, they have the Southern charm about them and stay well hidden from view. When you balance cockroaches that obey the law against cockroaches that don’t–. Hmmm. I might just go with the law-abiding ones.